The film, Milk, starring Sean Pean, is set to open today in San Francisco. In case you have not been paying attention to Hollywoodland, this is the flick about Harvey Milk, the local San Francisco politician who dedicated his life to gay activism and rights until he was shockingly slain. Apparently, the film company that produced this film is doing what Hollywood does best: downplay any tinge of so-called radicalism in this movie. Even though the movie pays a lot of attention to Milk's unequivocal fight for gay rights, the marketing folks have turned this into a movie about "hope and change" (gee, how conveniently unpolitical!). This is what infuriates me--liberals, and you know, they populate Hollywood in the majority, who on one hand screams for gay marriages so as to look progressive, but on the other hand, pander to mainstream sensibilities, all in the name of raking in the dollars. Their attitude is simple and straightforward--they will do anything to get ahead, anything to get moviegoers to show up, and never mind the moral scruples. Read the article below from the Hollywood Reporter. NEW YORK (Hollywood Reporter) – The opening of “Milk,” director Gus Van Sant’s account of California’s first openly gay politician, is four weeks away. Yet you wouldn’t know it. Unlike the hoopla over Focus Features‘ previous gay-themed awards magnet, “Brokeback Mountain,” which was drawing calls of agenda-pushing from right-wingers months before it opened in 2005, there’s been hardly a peep in editorial pages or on talk radio. Admittedly, the election is a major distraction. But Focus also is doing something deliberate: It’s eschewing publicity for the Sean Penn vehicle, keeping it out of the high-profile fall film festivals and heavily restricting media screenings. “The best way to help this film win over a mainstream audience is to avoid partisanship, and the best way to avoid partisanship is to let people find out about the film from the film itself,” said one person involved with the film. Giving up word-of-mouth to avoid hot air is not a typical trade-off — notice how Lionsgate effectively flogged politically charged movies like Oliver Stone’s George W. Bush biopic “W.” and the Bill Maher documentary “Religulous” — but it’s one Focus is willing to make. Not that it will last. The political football will be kicked off when the movie premieres Tuesday night in San Francisco and then put in play after the November 4 election. And when that happens, the studio will face a marketing dilemma: how to accommodate the gay-rights angle the core audience expects while appealing to mainstream filmgoers who might not be immediately moved to see a movie about the subject. One example of those filmgoers: At a recent Vegas test-screening for a middle-class, straight audience, several senior citizens tried to leave after a gay love scene in the early moments but couldn’t because they were trapped in the middle of a row (near Focus production chief John Lyons, in fact). The seniors eventually said they were happy that they stayed, but, like independent voters in an election contest, these are the viewers Focus must woo. Like its initial phase of playing keep-away from cable news, the post-election phase will also involve staying above politics. 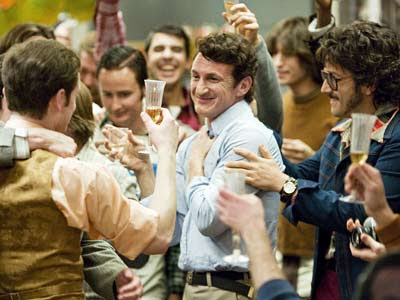 Focus plans on selling “Milk” in part as a story of hope and change (Harvey Milk, a member of San Francisco’s Board of Superviors until his assassination in 1978, won equal-rights battles against great odds), just as it sold “Brokeback” as a love story. The ploy was logical with “Brokeback.” It’s less so here. Like “Brokeback,” “Milk” features a gay romance. But unlike “Brokeback,” “Milk” is made by gay filmmakers, features the polarizing Penn and puts itself squarely in a political context. Milk’s fight against California’s anti-gay-rights Proposition 6 — a drama the movie deals with in great detail — spookily parallels the current California fight over Proposition 8, a measure that would ban gay marriage. Neil Giuliano, president of the Gay and Lesbian Alliance Against Defamation, said that “since this movie is about a beloved politician who was killed, it won’t be easy for our adversaries to fight us on it.” Focus and its Oscar handlers should get the weaponry ready anyway.